This is it: the boot comparison. I’ve compared boots before, it’s true — Wolverine Vs. Thursday, Viberg Vs. Alden, Alden Vs. Allen Edmonds Vs. Grant Stone — but this is different. Timberlands and Doc Martens aren’t just big in the world of boots, these two brands are probably the most popular boots outside this world. You know, in the real world, among people who don’t spend all day reading about boots online. They’re boots that anyone on the street recognizes and, seeing as they’re both plain, round toe boots, it makes sense that a lot of people have asked me to compare them. So I did, you’re welcome. Let’s take a look. I’m looking at the wheat nubuck Timberland 6’’ waterproof boot. (They’re available in a bunch of colors but this is the best known.) The nubuck is characterized by a slightly fuzzy texture from the protein fibers, and this one comes treated so that it is, as the name says, waterproof. They’re about six inches high and pretty bulky at that, so they don’t look great with slim pants or skinny jeans. They’re certainly not dressy by any stretch of the imagination. Despite all that, they’re still pretty versatile and can be worn with a variety of different styles. 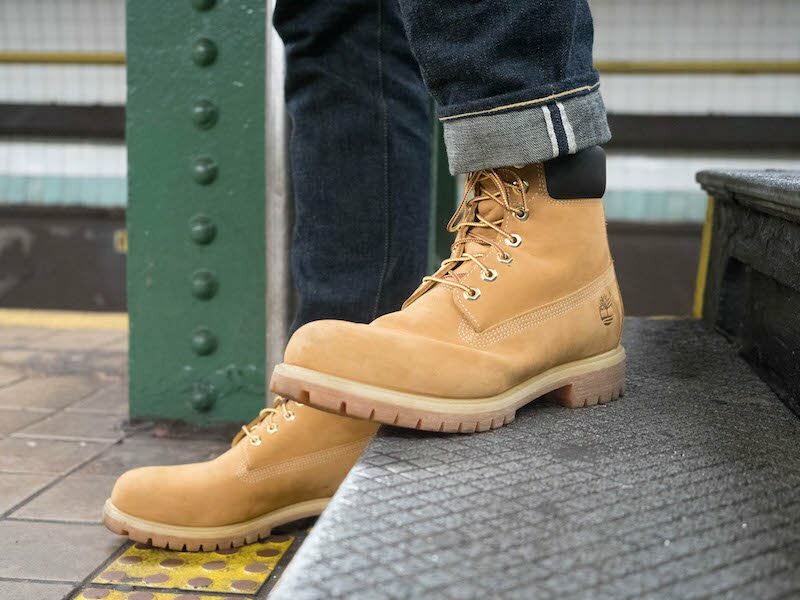 Other signature features of the boot are the chunky, grippy rubber lug sole (called Gripstick — Timberland really wants you to know that these boots have a good grip, and they do), the iconic Taslan nylon laces, and the leather collar for added insulation. Worth mentioning though you can’t see it, this boot is fully insulated with Primaloft and about half the insulation comes from recycled water bottles, which is pretty cool. 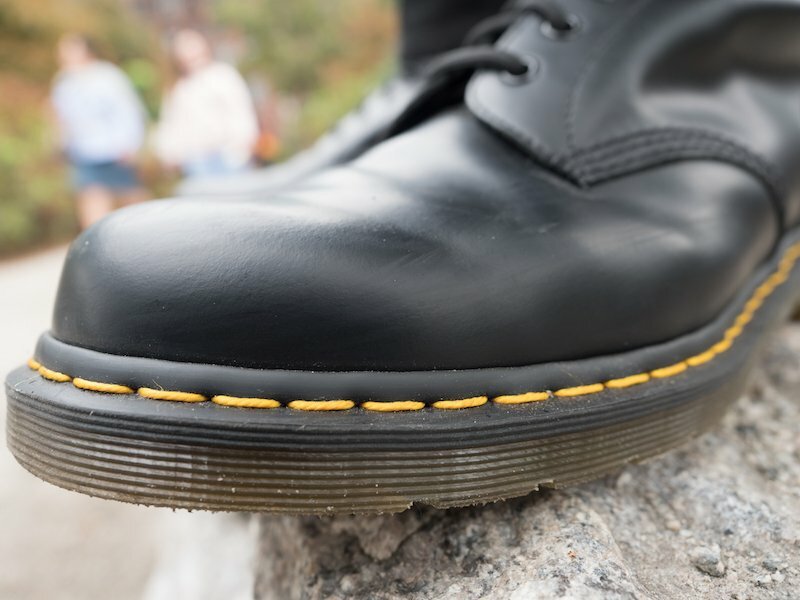 First things first: this is Doc Martens’ standard issue 1460, which is their most popular boot and is manufactured in Asia. I didn’t go with the British-made Doc because I’m focusing on the most popular boots and we live in the era where that boot is made in Asia. In fact, only around 1% of their boots are still made in Britain, according to Business Insider. This is a pretty uncomplicated boot: while Doc Martens calls this “full grain” leather it’s super slippery and smooth. The grain has been fully corrected out, making for a shiny, plasticky, relatively thin leather. 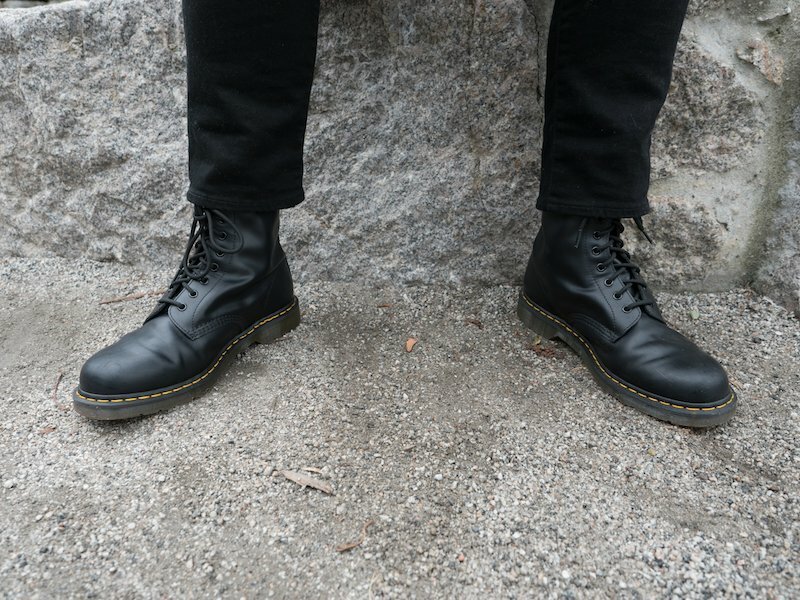 Unlike the Timberland, these Docs are mostly single stitched. They’re also not insulated at all and, at well over 7 inches, are a pretty tall boot so you’ll want to get yourself some nice long, warm socks if you’re gonna wear them around in the winter. The toe is rather snubby and overall the profile is a little blobby; it doesn’t contour the foot that well. But, they are slightly more streamlined than Timberlands and look better with skinny jeans and slim pants, if that’s your thing. The sole is made from an inorganic rubber that’s super soft, and attached to the upper with bright yellow stitching, one of the most iconic aspects of the boot. I think the sole is one of the best parts about this boot: it doesn’t have the stickiness that you can get with new Timberlands, and it’s a little more streamlined, too. The biggest difference between Timberlands and Docs at first glance is in the leather — thin, plasticky leather vs insulated nubuck — the thing they have in common is that neither of these are sophisticated boots. Like I mentioned before, these boots are actually made with nubuck, which is a kind of buffed leather. A lot of people assume it’s suede, which is understandable because suede also has a raised texture, but it’s not. The main difference between nubuck and suede is that nubuck is a top grain leather (which means that it’s made from the top layer of the animal’s hide), while suede is made from the inside of the animal’s hide. Functionally, nubuck is stronger and more durable than suede. This nubuck comes treated for waterproofness, which is nice. Obviously it’s quite brightly colored so the boots really stand out from any outfit and are a nice break from plain brown or black. Be warned: the big downside of this material is that it’s super hard to keep it clean. Even though they’re waterproof, they pick up little stains all the time and it’s really the most frustrating part of owning them. 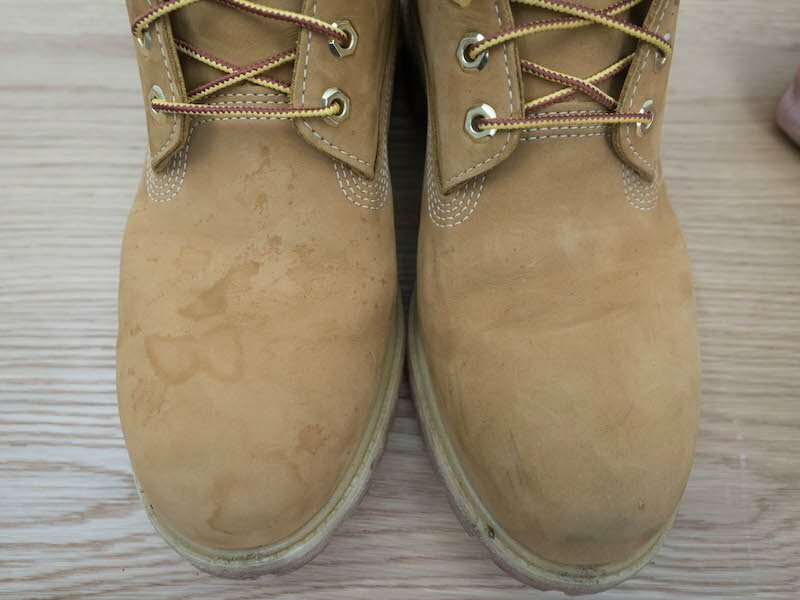 If you’re down to commit to the regular care they need to keep clean, you’ll want to get a pencil eraser and a stiff brush and maybe some Renewbuck, which is a care product sold by Timberland. This semi-bright leather comes from either South America or Asia, which is a very large swath of the globe but that’s all they would tell me when I called the Doc Marten helpline. It’s super, super smooth and doesn’t have any trace of grain on the skin. People sometimes call that “corrected grain” and it’s definitely a big part of why these look pretty plasticky, in my opinion. Care-wise, these are easier to keep clean than the Timberlands: just an occasional polish will do it. If you’re looking for water-resistance you’ll want to treat them with a product that has beeswax – the company is known for their “Wonder Balsam” which includes beeswax, lanolin, and coconut oil. I know that the aesthetic speaks to a lot of people but I gotta say it’s pretty cheap-looking leather and it certainly doesn’t look like it can withstand a lot of damage. That’s not to say that Timberlands’ nubuck is much higher quality (it’s not) or that these boots won’t last (I know there are a lot of old Docs out there). I’m just saying that if what you want is a commando-type boot that looks like it can be worn during an army tour, that’s not this boot. These Timberlands have a rubber Gripstick lug outsole, which is made from 10% recycled materials, a rubber midsole, a urethane insole, and everything is topped off with a removable foam insert. There’s no leather or cork to be found here, so don’t expect this sole to mold to your foot over time, but there is a steel shank which provides a nice bit of arch support. These shoes are pretty comfy right out of the box and the shock absorption is particularly good. Important to keep in mind: the sole is bonwelted, which means it’s cemented to the upper like a sneaker’s is. It’s waterproof and made with sealed seams, so I’m not saying that it’s poor quality, but I am saying that if you go through this sole, that’s it, the boot is done. They’re a popular enough boot that some specialty cobblers will resole them, but generally, don’t expect to be able to. My favorite part of these Doc Marten is definitely the sole. It’s super soft and has great shock absorption — back in the day, these boots were worn by people experiencing foot pain or other orthotic concerns and you can definitely feel it. After the rubber outsole, there’s a cork material and then a urethane insole, but there’s no shank, so this doesn’t quite have the level of stability that Timberland does. 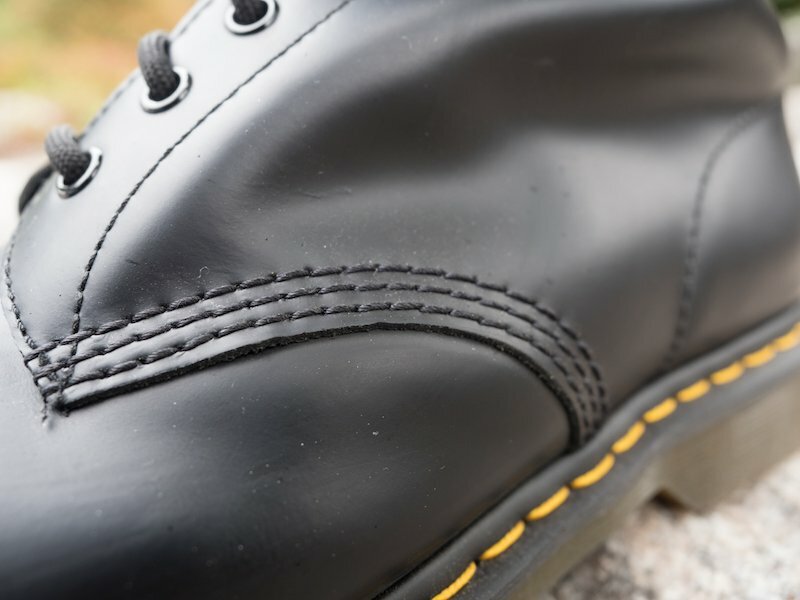 Also, though the pronounced yellow stitching looks like a Goodyear welt, it’s actually made with an unusual heat sewing technique that makes it kind of hard to resole them. Like with Timberlands, you might find a specialty cobbler, but no guarantees. I read that these were true to size, but I’m usually an 11.5 and wound up returning some pairs and going down to an 11. The 11 fits fine; it’s a pretty roomy boot. You could probably guess that it’s voluminous by looking at it from the side, and it is, which a lot of people like. Great arch support and shock absorption. No half sizes, which can be annoying. I got the 11s and they were fine, I probably would have been better with and 10.5 but a size 10 would have been way too small. In general though the boot has a pretty blobby, generic fit. The sole is super comfy and the shock absorption is great, but the arch support isn’t and it just doesn’t contour the foot very well. The price on both of these boots varies a ton since they’re so popular and easy to find on sale, eBay, etc. They’re both relatively inexpensive, for boots; if people tell you they’re expensive it’s because those people only wear sneakers. Generally between $160 and $180. Slightly cheaper: between $120 and $145. These boots are pretty comparable, and so it’s really up to you to decide which is best. They’re both inexpensive, reasonably versatile boots that fit into lots of different kinds of fashion. They’re both fine entry level boots but if you ask me, Timberland has the edge. 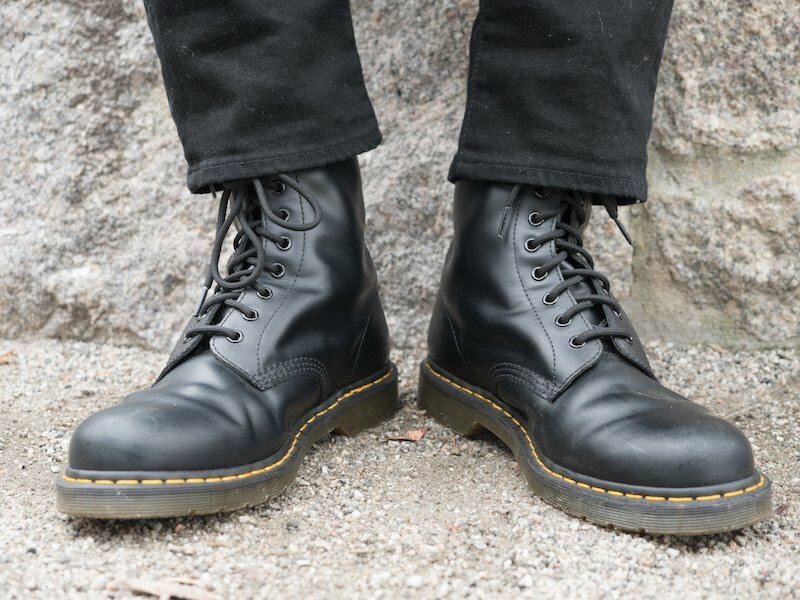 But if you want plain boots that you don’t have to think about cleaning all the time, or if you prefer a boot that feels more like a sneaker, or if you want to save some cash, you can go with the Docs.